Cardiff turned on breeze, blue skies and beautiful conditions for racing today, treating the spectators lining the Welsh shore to Stadium Racing at its best. 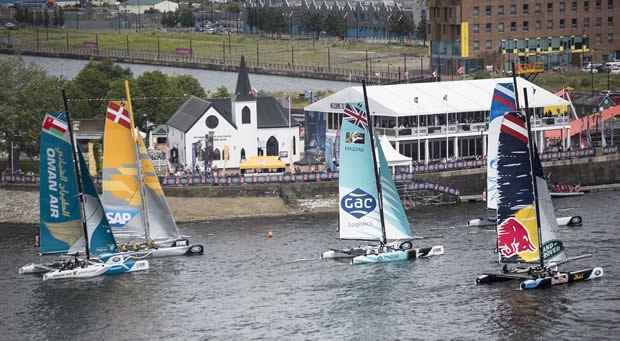 Despite a number of minor damage delays interrupting the flow, the eight Extreme 40 teams completed seven tough, but satisfying races. Rising to the top with four race wins and two podiums finishes out of a possible seven, The Wave, Muscat dominated the day, allowing Leigh McMillan and his crew to extend its lead on the leaderboard to 153 points. Current overall 2015 Extreme Sailing Series leader SAP Extreme Sailing Team had an inconsistent day, at times just on the edge of control in the testing conditions. Despite that, the team managed to add 55 points to its score line by the end of the day, enough to gain a place on the leaderboard, but still 21 points adrift of first place. The day belonged to British Olympian and Series veteran Chris Draper and the crew on board GAC Pindar. Draper’s influence on the team in today’s testing conditions was clear: in control when other more experienced teams were visibly battling with their Extreme 40s. Draper explained: “It was absolute glamour sailing, it was full noise on the boats, and you are kind of nursing them round but pressing them when you have to. I don’t think we had as many hairy moments as we did yesterday but everybody was still quite cautious, but you had to be because you could really get yourself into a pickle if you did something radical!" Co-skippers Draper and eight times JJ Giltinan 18ft Skiff champion Seve Jarvin finished the day with four podium results and their first event race win, moving themselves on to the podium in third on 128 points. Leading the chasing pack and holding onto fourth place, Red Bull Sailing Team’s Hans Peter Steinacher summed up the day: “The sailing is absolutely amazing, we love the breeze but it is also hard with the number of boats on this small course. The start is everything.” The Oman Air crew struggled to find their rhythm, physically blown out from the previous days racing, dropping off the podium to fifth after a challenging day. 1. The Wave, Muscat (OMA) Leigh McMillan, Sarah Ayton, Pete Greenhalgh, Ed Smyth, Nasser Al Mashari 153 points. 2. SAP Extreme Sailing Team (DEN) Jes Gram-Hansen, Rasmus Køstner, Thierry Douillard, Mads Emil Stephensen, Brad Farrand 132 points. 3. GAC Pindar (GBR) Chris Draper, Seve Jarvin, Tyson Lamond, James Wierzbowski, Kazuhiko Sofuku 128 points. 4. Red Bull Sailing Team (AUT) Hans Peter Steinacher, Jason Waterhouse, Jeremy Bachelin, Shaun Mason, Stewart Dodson 122 points. 5. Oman Air (OMA) Stevie Morrison, Nic Asher, Ted Hackney, Ed Powys, Ali Al Balashi 109 points. 6. Gazprom Team Russia (RUS) Igor Lisovenko, Phil Robertson, Garth Ellingham, Alexander Bozhko, Aleksey Kulakov 104 points. 7. Team Turx powered by Kaya Ropes (TUR) Mitch Booth, Can Bayulken, Selim Kakış, Diogo Cayolla, Pedro Andrade 92 points. 8. Lino Sonego Team Italia (ITA) Lorenzo Bressani, Enrico Zennaro, Andrea Tesei, Tom Buggy, Stefano Ciampalini 74 points.